In July–August 2003, the andesitic lava dome at Volcán de Colima, México, was destroyed by a sequence of explosions that replaced the 2×106 m3 dome with a crater 200 m across and 30 m deep. The two strongest explosions occurred on July 17 and August 28. The initial low-frequency impulses that they produced, which were recorded on broadband seismic records, allowed an estimation of the counter forces of the initiating process as being equal to 0.3×1011 N and 1×1011 N for the July and August events, respectively. The seismic characteristics follow the Nishimura-Hamaguchi scaling law for volcanic explosions, reflecting self-similarity in the processes initiating explosive events. 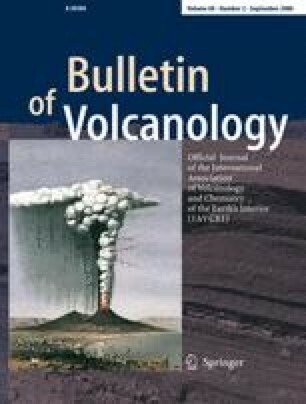 The results also show that counter forces can discriminate between the sizes of explosive eruptions that are assigned the same magnitude by conventional methods of classification such as the Volcanic Explosivity Index. The increasing use of broadband seismometers may therefore provide the basis for using counter forces to determine the magnitude of explosive eruptions. We thank Takeshi Nishimura for providing us with the codes for calculation of synthetics. We are grateful to Justo Orozco for help with the data acquisition. The comments of Chris Kilburn, Nick Varley and two anonymous reviewers were very useful. The processing of digital data was realized using the program DEGTRA provided by Mario Ordaz. Nick Varley improved our English text.